Heirloom Tiaras are constructed around a vintage or antique piece of jewellery...these are 'upcycled' and made into something unique and amazing for today's bride. These pieces are limited to the vagaries of availability and condition of old pieces of jewellery, many of which are a once in a lifetime find...this means that the probability is that this piece can never be repeated. 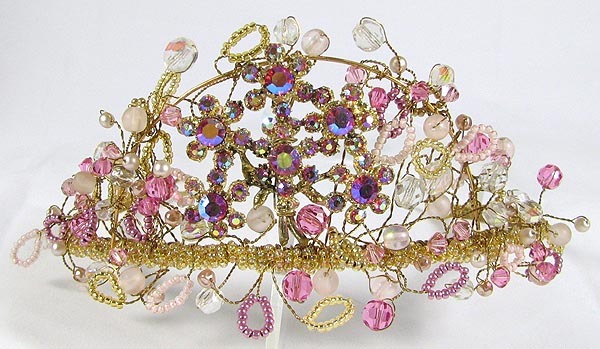 Aurelia Heirloom Tiara - with a comfortable handmade flexible base which means it won't pinch your head like mass produced ones can, this tiara features a stunning goldtone deep pink aurora borealis Swarovski crystal brooch from the 1930's, with antique Swarovski crystal beads, contemporary pink aurora borealis Swarovski crystal, Swarovski crystal pearls, Czech glass, Freshwater pearls, Rose Quartz; galvanised, gold lined and frosted rocailles and goldtone wire - available to buy now, this is the ultimate feminine 'something old, something new, (something pink!)'. Measures approx. 2 inches / 5cm tall - pink looks gorgeous on just about everyone, and the warm goldtones will make the beautiful bride glow in flattering rose and gold.